Well… it’s been FAR too long since I’ve been on here!! I was officially on a baking break for a while – after all the cakes I made, I needed to just stay out of the kitchen for a lil bit. My birthday was a few weeks ago, and for the second time my family went apple-picking for my birthday get-together, which was a lot of fun. This place (Garden Patch Farms) is AWESOME. We got Honeycrisp apples, two types of Asian pears, some peaches, bell peppers, pickles, broccoli, raspberries, blackberries, cabbage and who knows what else. There was so much to pick from, and we didn’t even get into some of the other stuff (they also had a tomato section and grape section). Anyway – when I got back to my place, I had a pint of raspberries and an entire refrigerator drawer full of Honeycrisp apples (yum). “What could I do with this?”, I wondered. Answer: tartlets. I had made the strawberry rhubarb tart earlier this year, and I have made apple pie in the paste. I figured that there must be some way I could make this work… although Internet searches only yielded various “crumbles” – and those are NOT easily transportable (or servable in my opinion). So once again, I decided I could make this up on my own. I had my strawberry rhubarb filling recipe. I had an apple pie filling recipe. I could totally do this. 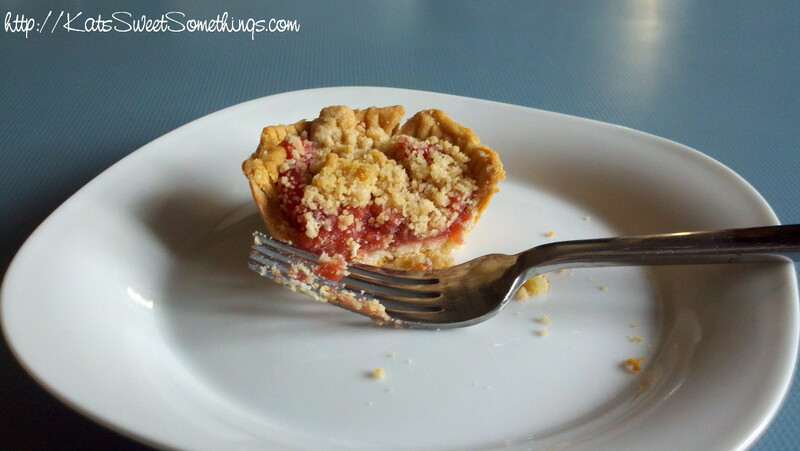 For this recipe I used my pate sucreé recipe and streusel topping recipe from the Strawberry Rhubarb Tart, and then made up the filling on my own. First, peel your apples to cut up. I cut mine into halves, cored them, and then sliced them at a medium thickness on my mandoline. I then took the slices and cut them into squarish shapes, maybe 3/4″ x 3/4″. (The point of this was so 1) they would fit into the tartlet cups and 2) they would be easy enough to bite through.) As you cut your apples, toss them in a bowl with the first lemon juice to keep them from browning. Melt the first butter in a saute pan over medium-high heat, then add in the apples. Saute lightly for around a minute or two, then add the first amount of sugar. Continue to stir this mixture occasionally until the apples are soft and the juices are very prevalent in the pan. In a small bowl, mix together the cold water and cornstarch to create a slurry – set aside. Once your apples have finished cooking, drain about 3/4 of the liquid out of the pan. Pour in the raspberry puree*, second sugar, second lemon juice, and cinnamon and saute for a few minutes. Add the slurry to the pan, which should thicken the mixture almost immediately. Once the apple-raspberry mixture takes on a gelatinous appearance, remove from the heat. Mix in the second butter until completely melted and combined. Pour the mixture onto a sheet pan lined with parchment paper and let cool completely before using. * I made my own raspberry mixture for this recipe. I pureed my raspberries in a blender, then ran them through a strainer to remove all those darn seeds (and there are a TON). I would highly recommend doing this, because raspberry seeds (to me) are just plain icky. Roll out the pate sucreé dough to around 1/4″ thick. Using a pizza cutter, cut the dough into 4 or 5″ squares. Use each square to line the compartments of a muffin tin, carefully setting the dough into place (do not press into place). After the compartments are lined, use a pizza cutter, spatula, or something to cut off the excess corners from the tartlet shells. Place a cupcake liner into each tartlet shell, and fill it with pie weights, uncooked rice, uncooked beans, etc. Bake the tartlet shells for around 12 minutes, until the edges start to turn golden and the cupcake lines pull out easily. Fill each shell with the apple-raspberry filling, leaving around 1/2″ a the top for the streusel topping. Sprinkle the streusel topping over each tartlet to almost cover the top, and lightly press to adhere. Bake for approximately 30 minutes, or until streusel starts to color and inside filling is bubbling slightly. Let cool in pan, then pop out and serve! This entry was posted in Baking by katj012. Bookmark the permalink.